A lot of people these days are having serious problems tackling stubborn acne and other skin conditions that can affect their facial appearance and cause some discomfort for them and others. If you are one of such, I am about to expose one common but unknown cause of your stubborn acne. Acne is skin condition caused by clogged skin pores and it is characterized by inflammation, breakouts, pus-filled pimples, red and tender bumps which can be large at times and appearance of dark spots. Teenagers and young adults are mostly affected than any other age group. It is estimated that 80% of the world’s population have had acne at one point in their lifetime. 1. Hormonal imbalance, this happens in the form of hyperactivity of the hormones androgens. Androgens are hyperactive during puberty and a low amount of androgen in a pregnant woman’s bloodstream can worsen acne. 2. Clogged skin pores, acne is triggered when your skin pores are clogged with excess oil, dead skin cells, and other impurities. 3. Excess production of oil, this is the reason why those with oily skin are more prone to acne than other skin types. The bacteria which causes acne feed on this oil below your skin pores and the more oil you have the more your risks of acne. 4. Bacteria and this is where your phones come in. There are a lot of bacteria on our skin, some are friendly and some are not and the population of this bacteria increases during puberty. Propionibacterium acnes (P. acnes) is one of the bacteria that causes acne. It thrives on oily skin, it releases substances that break down the sebum and eat it as food. Excess oil and dirt on the skin increases the population of P. acnes and this, in turn, increases the substances they produce which causes irritations in your skin. This triggers a quick response from your immune system and this leads to inflammation, breakouts and other signs of acne. They are some widespread speculations that diets like greasy foods, milk, and carbohydrate-rich foods can cause acne. This is not true, they don’t cause acne but they make it worse in those who already have acne. Other factors that can worsen acne are stress, some medications like corticosteroids and some makeup products like the oily ones. We all know that phone addiction is one common problem we are facing in this generation right now. Many effects of this unhealthy habit are known like the effect of blue light on the eyes, Dangerous rays emitted from the phones, wrong neck posture (tech neck) and many others but one. Many are unaware of “cell phone-induced acne”. One common and fast way we pick up bacteria like P. acnes is through our cell phones. There are lots of bacteria on your phone but we can’t see them with our naked eyes because they are microscopic. A study showed that our cell phones have more bacteria than a public toilet. It should not be a thing of surprise to you to know that there a lot of bacteria on your phones. Our cell phones are almost always in our hands, even when we are in the toilet. I have friends who can’t go to the toilet without their phones. Cell phones magnet bacteria and they create a safe haven for them. You touch a lot of dirty surfaces and still touch your phones without washing your hands. You drop your phones on dirty surfaces at times and to crown it all, you don’t clean it regularly. Oils from your face, your makeup, and other environmental toxins settle on your phone screen. All these lead to the accumulation of millions of bacteria on our phones. The bacteria infested phone then comes in direct contact with your skin when you make calls or pick calls. Whenever you pick or make calls, you introduce these microbes to your skin, they clog the pores of your skin and cause inflammation and breakouts. Dermatologists also believe that the pressure of the phone on your cheeks/skin triggers the formation of blemishes. 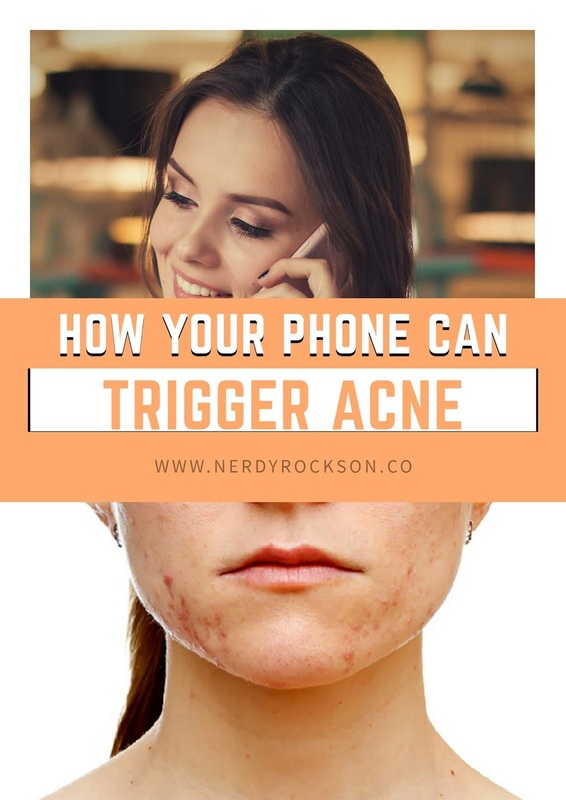 When a phone is on your skin, your skin starts to perspire and it even increases the amount of trapped oil in your skin pores and this increases the risks of acne. Now that you have known how your phones can cause acne, we will be looking at ways we can prevent this from happening. Use an antibacterial wipe or microfiber clothe and clean your cell phone at least once daily. Make this a compulsory routine if you are battling stubborn acne. Even if your phone doesn’t look dirty, still clean it every day. You cannot see microbes with your naked wipes. You can also try and purchase cell phone sanitizer online. It helps you cleanse the surface of your phone with the aid of UV light. The use of ear piece or headphones will prevent your phone from coming in contact with your skin especially if you don’t clean it daily. You can text more if you can’t afford a headset or a speakerphone. If you don’t clean your phone daily, you should try and reduce the number of direct contact your phone has with your skin. I am sure most people hold their phones against their cheeks with pressure. When you hold your phone with so much pressure against pressure against your cheeks, you increase your risks of blemishes. Don’t put unnecessary pressure on your skin, hold your phone firmly but lightly against your skin and you will be able to reduce your risks of phone-induced acne triggered by friction of the skin or pressure. Too much pressure from your phone on your skin will increase the stimulation of the oil gland and this will lead to an increase in acne flair-ups. Stubborn acne deserves a regular face cleanse like two times daily. This will help you open clogged skin pores and cleanse your skin, thereby reducing your risks of breakouts and inflammation. Go for original and natural face cleansers. Avoid harsh and chemical-based products. This will help you reduce your risk of acne even if you use your phone against your cheeks but it will still be better if you reduce the contact your phone has with your skin.